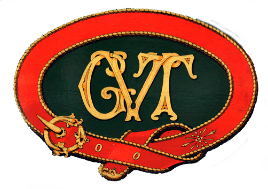 The Glyn Valley Tramway commenced operations in 1873 and for the first fifteen years of its life was operated by animal power. Horses pulled the trains up the valley from Pontfaen and goods trains running the other way were allowed to descend from Glyn Ceiriog by gravity under the control of a brakesman. It was a requirement of the Board of Trade that passenger services, offered from 1874, should be worked by animal power in both directions, although the GVT got into hot water for not adhering to this regulation. In December 1874 a party of passengers who had chartered a train turned up at Glyn to find not a carriage but a slate truck provided for them with a brakesman who had apparently had some alcoholic refreshment. A high speed journey ensued, and at a sharp bend by the river bridge at Pontfaen the truck and the entire party left the track and were deposited into the River Ceiriog. This incident resulted in a Board of Trade inspection of the tramway. To adapt to operating difficulties and the opening of the giant granite quarry at Hendre, the GVT was rerouted to meet the Great Western Railway at Chirk station and extended to Hendre in 1888, when it was also converted to steam working. Slate, flannel, coal, timber, the mails - even gunpowder for the quarries and live fish in milk churns were carried but the mainstay of traffic was granite. 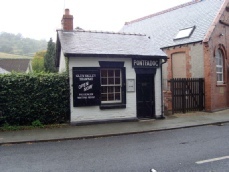 Passenger services were again offered and while stations and booking offices were provided at Chirk and at Glyn (the passenger terminus) it was not until 1st October 1893 that the GVT purchased the land on which to construct its waiting room at Pontfadog. Trains generally ran mixed, with passenger and freight vehicles making up one train. A normal day would see about four mixed and two goods trains passing through Pontfadog in each direction though there were passenger excursions in the summer months and at bank holidays. As the tramway mn on the other side of the road from here passenger trains stopped opposite the waiting room. Tickets were issued by the guard from his van. While this was happening the driver might oil up his engine, and in cold weather walk across the road with a shovelful of burning coal to start off the waiting room fire. This would be fed with coal from passing engines throughout the day. A loop where trains sometimes passed each other was provided opposite the playground, but the village boasted no sidings or goods facilities. Occasionally a train travelling up the valley would drop a wagon of coal off on its way up to Glyn, leaving it on the main running line for its contents to be hurriedly offloaded into a nearby property. Once it was emptied, the wagon would be rolled down to the loop to clear the running line and await collection by another train in due course. 'The doors of the White Swan were open and some of the passengers could not resist the temptation to enter and taste the beverage. They felt sure that the train would wait for them. But they soon found out that they were taking too much for granted. The tramway employed 4 locomotives, 14 coaches and around 250 wagons and work was provided for approximately 32 staff. By the 1930’s the quarries were closing or turning to road transport. Rival ‘buses could take people directly to Oswestry or Llangollen at twice the speed of the train and without the need for a change in Chirk. One operator kept his ‘bus just ahead of the GVT trains, collecting all the fares and passengers just before the train appeared around the bend. The GVT could not compete. Passenger trains ceased in 1933; goods workings lasted another two years. 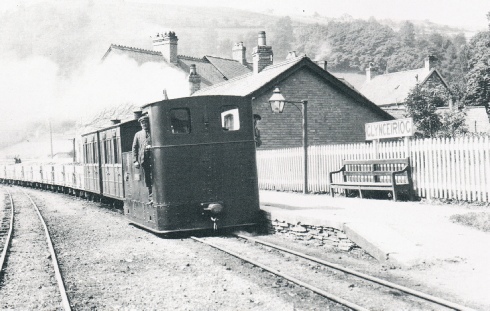 The last rites were enacted on Saturday 6th July 1935 when the locomotive ‘Sir Theodore’ and a brake van descended to Chirk, this final trip being witnessed by scores of people at Glyn Ceiriog and others all the way along the entire length of the valley. The tramway rails were removed in 1936 and the locomotives and wagons were scrapped. The goods vans and coaches fared better, being sold shorn of their wheels and underframes for 5/- (25p) each. They lasted for many a year as outhouses on farms in the locality and two survive to this day, in altered form, running on the Talyllyn Railway. 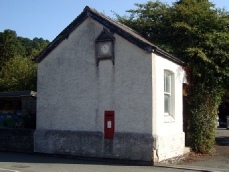 Pontfadog Waiting Room was sold by the GVT Liquidator to a Mr R W Ellis of Pontfadog Post Office on 27th October 1936. By the early 1950’s the building had become the local collection point for the payment of rates, hence its nickname in those days: ‘Pontfadog Town Hall’. The rates collector would light a fire and make himself quite snug whilst waiting for his customers. The property passed into the hands of people running a nearby inn and they used it as a store. In the 1970’s it changed hands again, becoming a shop selling metal detectors and lapidary equipment. On 6th July 1985, with another new owner, it opened up as ‘The Little Shop’, selling gifts and hosting a Glyn Valley Tramway Group display about the GVT at Pontfadog. The waiting room again went on to the market in 1989 whereupon it was purchased by the Tramway Group, and the property is now vested in the name of its trustees. The Group has undertaken much work to bring the building up to the standard in which you see it today including the rebuilding of the chimney, plastering, electrical work and the laying of a concrete floor and the damp proof course under the original quarry tiled floor. The seats around the walls and the fireplace are original and date from the 1890’s.